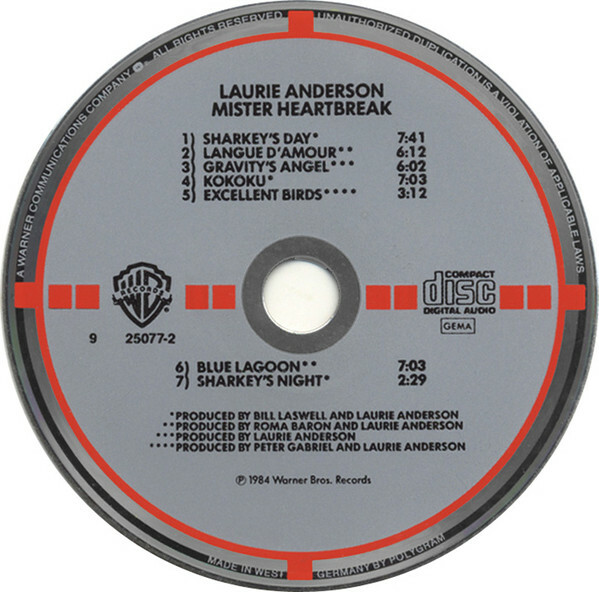 I was certainly sensitive to Laurie Anderson’s move from the art world to the dirty business of “rock and roll.” I’d bought her “O Superman” single when it was more widely available on Warner Brothers Records in 1981, but I had never bought a copy of her debut album, “Big Science,” until I bought the DLX RM CD of it in 2010. That does not make much sense because I immediately bought her second album, “Mister Heartbreak” upon its 1984 release. I was not far behind in buying the CD of it, either. Probably no later than 1986 by my reckoning. It was one of the sought-after WEA “target CDs” called such for obvious reasons, as seen by the photo at left. [Memo to self: I should blog about this tributary of the great CD river one day.] I’ve owned this album basically from the point of release, in one form or another. And I quickly bought her next studio album, “Home Of The Brave” on its release as well. Then for reasons that make no sense, I waited for over 20 years to complete the Laurie Anderson collection. And even that was down to my wife’s belated discovery of how interesting her record were [she had hated “O Superman” from back in the day and only changed her mind on Anderson after her fave internet radio station exposed her to more] and blossoming into an actual Laurie Anderson fan. Looking back, maybe her long gaps in releasing new music after “Home Of The Brave,” Three years spanned the gulf between her next one, then five years became sort of the norm… if you were lucky. I had first gotten wind of “Mister Heartbreak” in the form of a Warner Brothers trade ad printed somewhere [Trouser Press?] that claimed that it was an upcoming EP of Anderson, but obviously plans changed between then and the time to market. While seven tracks is a bit large for an EP [they prosper at 4-6 tracks, usually] it could have happened, if the timings were right. Seeing as how this album is a reasonably full 4o+ minutes, then that’s certainly not EP material. 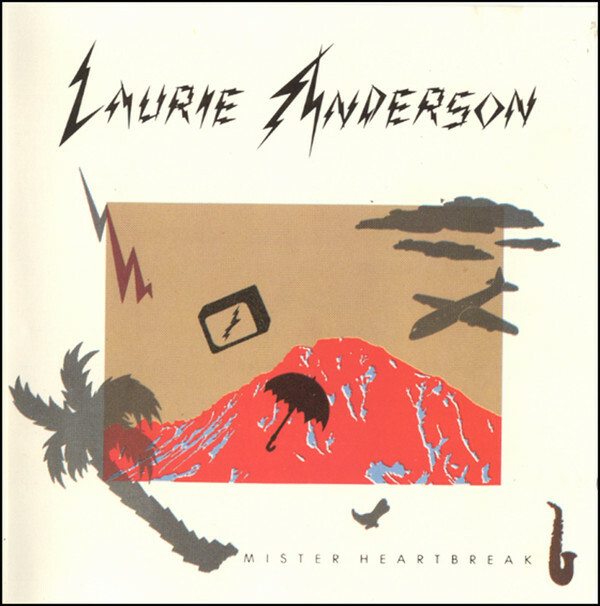 The first track remains my all time favorite Laurie Anderson track. 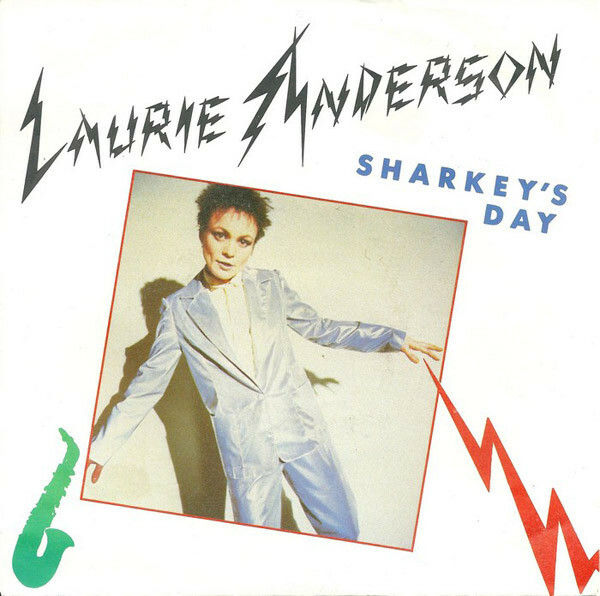 I had seen the music video for the single “Sharkey’s Day” maybe once or twice before buying the album. Probably on Night Flight’s “Take Off.” It was a curt, 4:10 edit of the more expansive 7:41 album track. The track was awash in new technology and the cream of art rock as Anderson made her bid to meet music at a halfway point or better from her traditional performance art ghetto. The talent on the track was prodigious. Adrian Belew of King Crimson on guitar. Anton Fier of The Feelies on drums. Bill Laswell of Material on bass and in the co-producer’s chair. Anderson stuck to her shiny new Synclavier, and the secret weapon on the cut may have been Daniel Ponce on an array of African percussive devices. The end result was a rambling, roiling, almost biological concoction teeming with what seemed like thousands animal calls surrounding Belew’s wheezing guitar with a tropical density bordering on feverish. This entry was posted in Record Review and tagged 1984, CD, Laurie Anderson. Bookmark the permalink. The heavy use of sampling and the guest musicians makes Misterr Heartbreak a very interesting album,quite unlike her other work in many ways,though they all contain these elements to some degree. I was fascinated by her home-made instruments and innovative use of electronics-as a budding synth buff myself it set me on a journey.